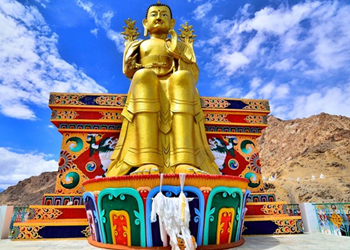 Situated at a distance from Saspol, the Likir Gompa was founded in the 15th century. This monastery belongs to the Gelugpa sect of Buddhism. It houses nearly 120 monks and belongs to the Yellow Hat sect. One of the attractions is the hand painted mandala of Wheel of Life which is held by Yama and the main hall or Dukhang has seats for the monks where religious prayers are held. Adorned by Thangkhas, the Dukhang is a sight to behold with the large chortens and has a statue of Avalokitesvara. Various statues of Buddha in distinct forms along with Amitabh, Skyamuni and Maitreya adorn the temple. Another statue of Tsong-kha-pa has been set on the other side. The throne seat is set for the visiting heads of other gompas. Likir monastery is the venue for the annual event of Dosmochey, in which people gather for the offerings. This event, according to the Tibetan calendar, is held from 27th to 29th day of the 12th month. Sacred dance is the main attraction of this event.